How is the LASIK corneal flap created? In LASIK, the flap is created one of two ways: with a microkeratome blade or femtosecond laser. Is there an advantage of the femtosecond laser or microkeratome blade in creating the flap? Femtosecond laser is rapidly becoming known as a key ingredient to optimizing visual results in laser vision correction surgery. In traditional surgery, the corneal flap is created with a microkeratome, a metal blade within a mechanical hand-held device. While this generally provides good results, the procedure can result in complications because it is difficult to ensure an accurate depth and consistent thickness of the flap with blade technology. By replacing the traditional microkeratome blade approach with a silent, tiny beam of laser light, the femtosecond laser reduces the risk of complication in creating the corneal flap; in fact, more patients may be candidates for laser vision correction due to this unique level of precision that was previously unavailable. 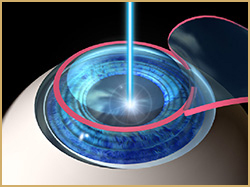 The femtosecond laser creates the corneal flap with a precisely predetermined pattern and depth. This laser precision offers a unique level of safety in the creation of the corneal flap, and enables the surgeon to safely create a corneal flap of precise shape and thickness. In the past, people with corneas too thin, flat, steep or irregular weren’t considered good candidates for LASIK. With the femtosecond lasers high degree of accuracy we are now able to help many more people reduce their dependency on glasses and contacts. Custom LASIK, also called Wavefront or CustomVue LASIK, allows for a more customized treatment based on 3-dimensional measurements of your eye. The wavefront technology uses light to make a map of your eye. While two people can have the same eye prescription, no two people have the same wavefront measurements. Custom LASIK usually results in fewer “higher order” aberrations, tiny imperfections which affect your overall quality of vision, such as visual glare and halos. Given that Custom LASIK can treat higher order visual aberrations that cause problems such as starbursts, halos, and decreased contrast sensitivity, Custom LASIK appears to be more effective than Conventional LASIK. 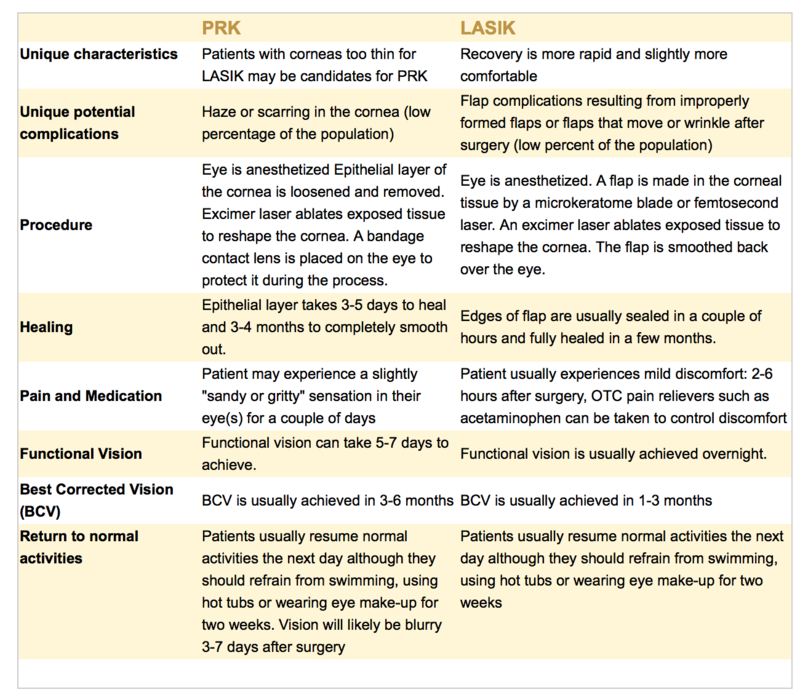 Will I still need glasses or contacts after Custom LASIK surgery? Will CustomVue LASIK affect my night vision? Most participants’ in the FDA’s study reported that their night vision improved after undergoing the CustomVue procedure. Four times as many patients were more satisfied with their night vision after wavefront LASIK than who were before. The ideal candidate for laser vision correction is an individual at least 21 years of age or older and has healthy corneas. Your vision should also be relatively unchanged over the last year. People with certain medical conditions are not candidates for laser vision correction. It is best to consult with Dr. Findlan at the Pittsburgh Eye Institute during your complimentary consultation to determine whether LASIK is the best choice for you. Can I have both eyes done the same day? With the LASIK procedure, both eyes are typically done the same day. PRK heals more slowly and therefore you will have the option to have the second eye treated a few weeks later or that same day. Is LASIK safe? What are the risks involved? More than one million procedures are performed each year in the United States. Seldom does a complication affect visual outcomes. As with every medical procedure, there are risks involved with Laser Vision Correction. You will receive a thorough explanation of all the risks and benefits involved with these procedures when you meet with Dr. Findlan. Many patients can read the clock on the wall in the laser room immediately after LASIK. You will also be able to sit up to look out at the nature scene through the windows without glasses or contacts for the first time. Many patients are already thrilled with the results. However, your vision will appear to be somewhat ‘steamy’ for several hours following surgery. Your sight may fluctuate for a few weeks following your procedure, but will improve during that time. It’s important that patients have realistic expectations. While not all patients undergoing LASIK gain 20/20 vision, most see at least 20/40 or better the day after the procedure. That qualifies an individual to pass a driver’s license exam without wearing glasses or contact lenses.